Wed., Aug. 22, 2018, 8:07 a.m.
CARACAS, Venezuela – A strong aftershock jolted Venezuela’s northeastern coast Wednesday following the most powerful earthquake to hit the area in more than a century, though officials said neither caused major damage or deaths, apparently due to their depth. The magnitude 7.3 quake Tuesday was the largest to strike Venezuela since 1900, according to the U.S. Geological Survey. But at a depth of some 76 miles beneath the Earth’s surface, it appeared to have caused only limited damage even near its epicenter a few miles off the Cariaco peninsula that stretches into the eastern Caribbean. The magnitude 5.8 aftershock at 9:27 a.m. (1327 GMT) on Wednesday also was centered relatively deep, 61 miles below the surface. It was felt lightly in the capital. “Shaking does die off at a distance,” said seismologist Lucy Jones, a research associate with the California Institute of Technology, adding that the earthquake’s considerable depth likely prevented a tragedy. In Cumana, the biggest city near the quake’s center, supermarket shelves came crashing down on Tuesday. 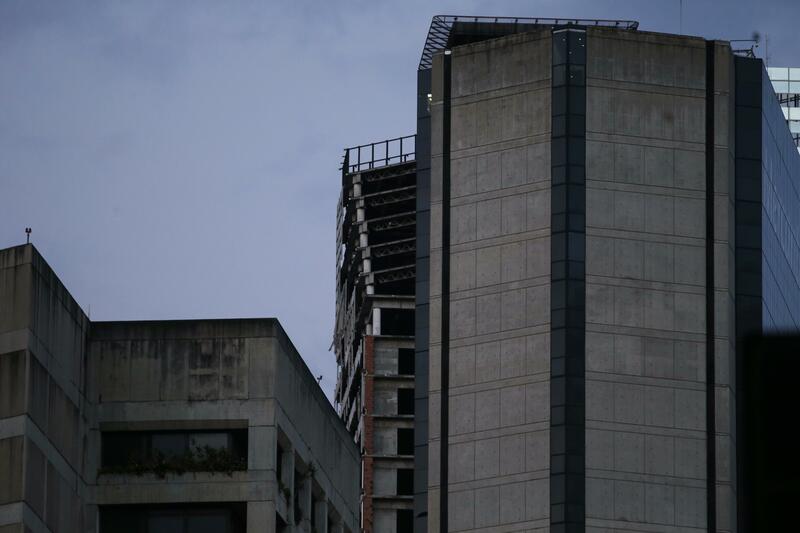 In downtown Caracas, Venezuela’s capital, concrete from the top floors of the unfinished Tower of David skyscraper fell to the sidewalk, forcing firefighters to close off traffic. A block away, children wearing surgical masks stretched their necks to peer at the 620-foot building after fleeing a building housing a foundation for children suffering from cancer. “We felt something strong and they told everyone to run,” said Marisela Lopez, who was at the foundation with her 7-year-old daughter when the quake struck. Construction of the Tower of David began in 1990 as a symbol to the OPEC nation’s ambitions of becoming a regional finance center. But it was abandoned after a banking crisis and in the past two decades of socialist rule has become a symbol of urban blight and has been occupied by squatters until 2015. Power outages were reported across nearby Trinidad, where people ran into the street and gasped as large glass panes at one supermarket shattered and falling concrete smashed several cars. The quake was felt as far away as Colombia’s capital of Bogota, where authorities briefly closed the international airport to inspect for runway damage. The confusing moments after the quake were captured live on Venezuelan state television as Diosdado Cabello, the head of the all-powerful constitutional assembly, was delivering a speech at a march in support of the socialist government’s measures aimed at countering economic crisis. “Quake!” people yelled as Cabello and others looked from side to side with a mixture of laughter and concern. “It’s the Bolivarian revolution speaking to the world,” Cabello thundered to applause. Experts have long warned that Venezuela’s cash-strapped government is ill-prepared to deal with a major natural disaster. Hospitals have scant supplies, many ambulances are idled and food and water are among goods that have disappeared in a country suffering from inflation estimated by the International Monetary Fund to reach 1 million percent this year. The earthquake also was felt in Guyana, Barbados and Grenada. Published: Aug. 22, 2018, 8:07 a.m.